As Huawei faces more scrutiny over its 5G networking equipment, the national security adviser to former prime minister Stephen Harper and Conservative Member of Parliament Erin O’Toole are strongly urging the Canadian government to ban Huawei. Over the weekend, Richard Fadden, Harper’s national security adviser from 2013 to 2015, penned an editorial in The Globe and Mail stating his concern as to what China could do if it had access to Canada’s networks. “If China would resort to putting Canadians to death to defend its corporate national champion, what might it do if the Chinese Communist Party had unfettered access to Canada’s vital communications network?” Fadden asked in the January 20th, 2019 piece. Fadden was referring to Robert Schellenberg who was sentenced to death on January 14th, 2019 for drug smuggling. Schellenberg’s death sentence has been viewed as another form of retaliation by China against Canada for arresting Huawei’s chief financial officer Meng Wanzhou in Vancouver on December 1st, 2018. Meng was arrested on fraud-related charges. She was granted bail but faces extradition to the U.S.
Former Canadian diplomat Michael Kovrig and entrepreneur Michael Spavor were previously detained shortly after Meng’s arrest and are currently held in custody by Chinese authorities. Canada has had a relationship with the telecommunications giant since 2008. Since coming here, Huawei has built research partnerships with several universities and is working with Bell and Telus to provide 5G equipment. MobileSyrup reported on January 19th, 2019 that Vancouver-based carrier Telus released a memo sometime last week to about 30,000 employees last week defending its use of Huawei equipment. On January 19th, 2019, Montreal-based carrier Bell also sent a memo to its employees defending Huawei. The memo notes that there are no safety related concerns with the Huawei smartphones Bell offers to Canadian consumers. It added that the debate is about a network that hasn’t even been launched in Canada yet. Out of fear of cybersecurity attacks, the U.S. banned the company from providing 5G equipment in August 2018. Following the U.S., Australia and New Zealand have also banned the company. The three countries are part of the Five Eyes-intelligence sharing alliance. Other members include Canada and the U.K., both countries currently are still working with Huawei. Public Safety Minister told reporters during the Liberal cabinet retreat in Sherbrooke, Que. that the government continues to look into the security implications and technical standards that relate to the deployment of 5G networks in Canada. “The process is obviously ongoing, we are examining the security issues as well as the technical issues with a great deal of care. We’ve made it abundantly clear that we will not compromise national security,” Goodale said on January 18th, 2019. However, Goodale told The Canadian Press on January 21st, 2019, that there were other firms that can build out 5G networks. Right now, Canadian officials are conducting two reviews separate to 5G rolling out in Canada, one with regards to spectrum, and another concerning national security. But Fadden said that if China will do anything to protect its country, Canada should be forceful and do the same. “Denying Huawei participation in our 5G network is not a rejection of engagement with China. There is no option to not engage with China, which is an emerging superpower with no real counterweight in the West, thanks to an unpredictable U.S. administration. “The current spat will be resolved not through public exchanges but through back channels, perhaps through an interlocutor. But in the meantime, Canada cannot be deterred from defending its interests by strong words from Beijing,” he said. 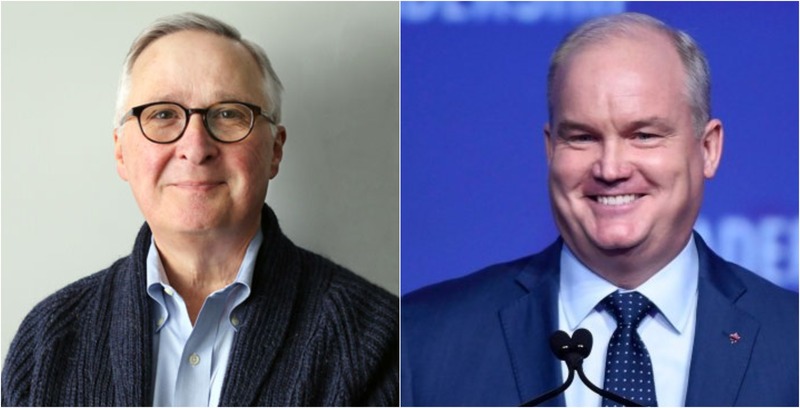 O’Toole, who is also the foreign affairs critic for the Tories, said during an interview on Global News’ West Block that Prime Minister Justin Trudeau needs to show “leadership” by banning Huawei.